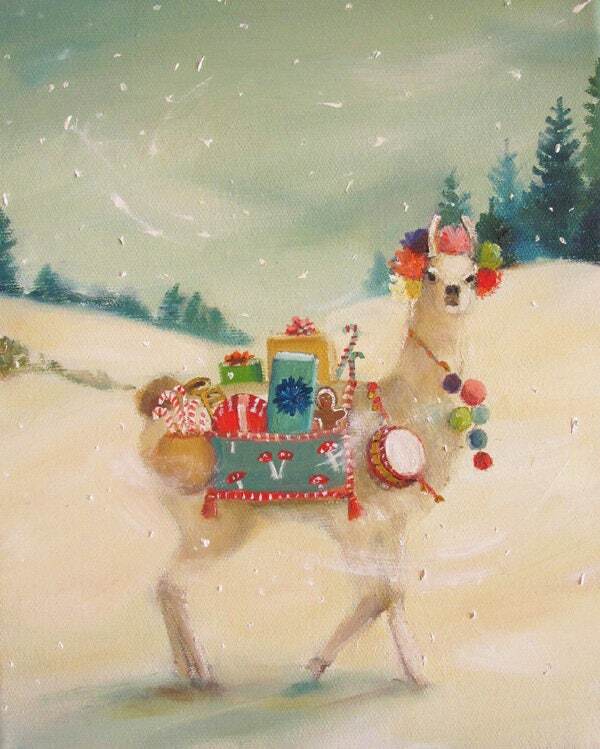 Title: The Northern Christmas Llama Was Elusive But Generous In Nature. Image size: Approx 11"x14". Paper size: 13"x19"
Printed using Epson Ultrachrome archival inks on heavyweight matte fine art paper ( 100% cotton rag). Signed and dated in pencil just below the image. This print is shipped in a cello sleeve and rolled inside a thick protective mailing tube. *please note that if multiple prints are combined with an 11"x14 print they will also ship rolled in a mailing tube. Canadian buyers- please note that sales tax will be charged on Canadian orders. We ship from Canada! Shipping times can vary depending that the country that you live in. USA: Standard airmail 7-25 business days. Expedited options are available. Please inquire. UK: Standard airmail 7-25 business days. ****Please be aware that on occasion due to circumstances beyond our control, some orders may take longer to arrive than normal. Usually this is the result of weather or postal excess. If you are experiencing a delay in receiving your order, please let us know but please be aware that we only ship out replacements 30 days after your order was mailed. Lost orders are very rare but postal delays do happen unfortunately. Please be aware that if you purchased an original oil painting, drying time is usually about 7-10 days prior to shipping. Original oil paintings ship with insurance and tracking. We are not responsible for customs fees or duty that may be incurred during shipping. ****ORDERS SHIPPING TO THE UK AND EUROPE. Please be aware that we are not responsible for customs fees, taxes and VAT that maybe levied on your order. Please contact your Customs office prior to ordering to find out what types of taxes/duty and VAT that may be levied on your order. We will not accept or refund refused items because of duties, taxes, or VAT as we will be charged additional shipping and handling fees to have it sent back to us. Shipping charges include packaging materials and insurance. Please note that we do not accept returns due to the delicate nature of our paper products. If you receive any items (prints or paintings) that are damaged, please contact me within 3 days of receiving the damaged item(s) and I will replace your print(s) and ship them free of charge. Order cancellation: Please be aware that we charge a $5 restocking fee for any order that is cancelled after it has been packed. This fee covers our shipping supplies and labour. At this time, I am unable to take custom orders for original paintings. If you are a retail store and would like to carry my prints, please contact me about my wholesale policies or visit my shop on etsy wholesale. All paintings and prints are copyright of Janet Hill. To complete your order, you must provide me with certain information (which you authorized Etsy to provide to me), such as your name, email address, postal address, payment information, and the details of the product that you are ordering.